Complete whole house water purification system delivers filtered water to every outlet in your home. Enjoy the FINEST drinking, bathing & cleaning water ever! Bottled water quality at your tap. Soft, clean water at every faucet protects your health, home & pipes and saves $$ on bottled water costs. Easy one-time installation lasts decades, increases property value. Greatest investment value for your health and quality of life – Delight in purified water everyday! Perfect for homes with 1-3 bathrooms. Available at ultra-low introductory manufacturer direct pricing for a limited time. Complete whole house water purification system delivers filtered water to every outlet in your home. Enjoy the FINEST drinking, bathing & cleaning water ever! Bottled water quality at your tap & soft, clean water at every faucet protects your health, home & pipes and saves $$ on bottled water costs. Easy one-time installation lasts decades, increases property value. Greatest investment value for your health and quality of life – Delight in purified water everyday! Perfect for homes with 3-6 bathrooms. Available at ultra-low introductory manufacturer direct pricing for a limited time. 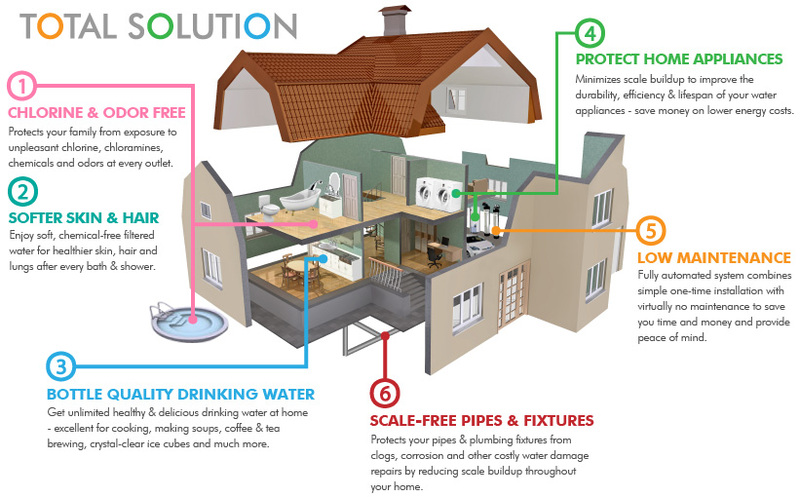 High-efficiency whole house water purification system delivers soft, filtered water throughout your home. Perfect for homes with 1-3 bathrooms. Metered softener produces silky soft water & heavy scale removal. Bottled water quality at your tap & filtered water at every faucet for better health & savings. Easy one-time installation lasts decades. Greatest investment value for your health, property & quality of life – Delight in purified water every day! Available at ultra-low introductory manufacturer direct pricing for a limited time. High-flow & efficient whole house water purification system delivers soft, filtered water throughout your home. Perfect for homes with 3-6 bathrooms. Metered softener produces silky soft water & heavy scale removal. Bottled water quality at your tap & filtered water at every faucet for better health & savings. Easy one-time installation lasts decades. Greatest investment value for your health, property & quality of life – Delight in purified water every day!